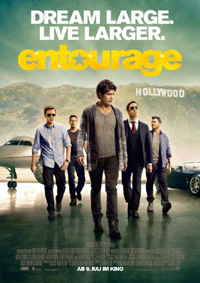 For those unfamiliar with HBO's Entourage, over ten years ago this TV series kicked-off with an (adult) look at a group of young Hollywood guys and their pursuit of pleasure and success. Loosely based on series creator Mark Wahlberg's experiences, at its core it has a naughty sense of humour and audacious attitude. At the centre of the group is actor Vincent Chase, his entourage in question including his actor brother Johnny, friends Eric and Turtle, and his former agent Ari. I never got to see most of the last series or its finale, but that doesn't really matter. If you know the characters, you'll know their personalities, quirks, pros, cons and idiosyncrasies. If you don't, it doesn't take long to grasp. Eric is still Vincent's agent and Ari is now running a studio. Vince has progressed to directing his first feature film (acting as the lead, and casting his brother in a supporting role), with Ari producing. But, he needs more money to finish it, and make it just-right. Ari has to wing it to Texas against his will to scrounge more money from the good-ol' boy investor (Billy Bob Thornton) - But, he sends his son back to Hollywood with Ari to keep an eye, observe and report back to him. Soon this dweeb (played by a grown up Hayley Joel Osment) starts to suggest changes to the movie that could sink it. Around this narrative (besides them all ragging on each other) all the main and supporting characters have their own story lines running parallel: Ari has to appease his wife by leaving his (high pressure) work at the office, staying calm, and attending counceling; Eric's ex is having their baby while he's seeing someone else; Johnny is having an on-line perv affair; Turtle has a hard-to-get love interest - extreme female fighter Ronda Roussey, in a bit of an extended role transcending a mere cameo. While on the subject, where it seemed like Sharknado 3 may be in the running for most cameo appearances, being a film industry themed movie, Entourage has wall-to-wall names from actors and TV personalities to sportsmen and musicians (like Liam Neeson, Jessica Alba, Ed O'Neill, David Spade, Piers Morgan, Mark Cuban, Maria Menounos, Thierry Henry, Jon Favreau, T.I., Pharrell Williams, Greg Louganis, Mike Tyson, Bob Saget, Kelsey Grammer, Matt Lauer, Gary Busey, Mark Wahlberg obviously, and loads more). While most of these are cameos for cameo's sake, with throw-away one-liners, some are actually worked into the narrative and how these people link up to the gang's lives. If you enjoyed the series, while this is very much an extended episode (with no limits at HBO, they needn't outdo the show here), you'll certainly enjoy this.